The Taipei Arena, formerly known as the Taipei Municipal Baseball Stadium, is located in the Songshan District at the intersection of Dunhua North Rd. and Nanjing East Rd. At the end of the year 2000, the Taipei City government decided to replace the ballpark with a 15,000-seat multipurpose stadium. Construction began on November 12, 2001 and was completed on July 27, 2005. The stadium officially opened for use on December 1, 2005 and was named the "Taipei Arena". The Taipei Arena is an important indoor facility within the city of Taipei's overall exercise facility construction plan. The building is divided into the main hall and subsidiary arena. The main hall is comprised of 2 underground levels and 5 reinforced concrete levels above ground, covering an area of approximately 90,900 square meters. The interior floor of the main hall is 76m long and 41.5m wide and about 60m X 29.5m when all retractable seats are fully extended. When needed, the center floor can be completely frozen and become a standard indoor arena for sports or other events held on ice. The arena can be used for a variety of purposes based on need. Because of this, the arena was able to host top of the line racing competitions held by SportAccord (International Sports Federations) and is also in hot demand by both domestic and international arts groups who compete to rent it out for a variety of shows. Basketball games, tennis matches, etc. Can accommodate approximately 15,000 seats. Concerts, etc. Seating accommodates approximately 13,000 seats (actual amount of seats available is determined by the size of the stage). Concerts, jamborees, etc. Can accommodate approximately 11,000 seats (actual amount of seats available depends on the size of the stage). Concerts, musicals, performing arts, etc. Can accommodate approximately 7,000 seats (actual amount of seats available depends on the size of the stage). In addition to providing the finest layouts for watching athletic events other activities, the Taipei Arena is able to accommodate audio amplification equipment based on the needs and plans of the host organization. The asymmetrically shaped roof decreases sound diffraction throughout the large open space and improves reverb issues. The high altitude catwalk is coupled with a safety net which greatly increases the safety of construction workers working within the building. In addition, large loading and unloading trucks, cars and cranes can easily enter the building based on need which greatly decreases the time spent setting up for events and restoring the arena to its initial condition. Within the main stadium are makeup rooms, lounges and offices of different sizes provided for the use of competitors, performers and administrative personnel. In addition, the lounges and unloading docks are equipped with both cable and wireless internet service. 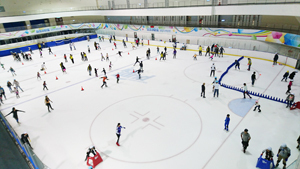 The Subsidiary Arena (the Ice Land) is frozen year round and is the only ice skating rink in Taiwan which is in accordance with international ice skating rink standards. There are approximately 800 seats within the arena. The ice rink is 61m x 30m and is configured with equipment and facilities needed for both ice hockey and speed skating, making it possible to hold standard indoor on ice sports events. The arena is opened for public use during the day and many different types of training classes are offered. 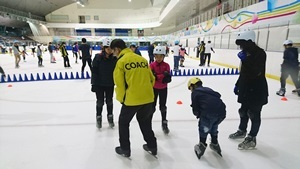 The Ice Land also welcomes school clubs or companies to apply for group events at the arena where they can arrange for lessons taught by experienced skating coaches who will help them enjoy the wonder of ice skating. Moreover, the Taipei Arena includes an additional 2,000 square meters of business facilities including well-known restaurant chains, convenience stores, fitness centers, family fun centers, health product stores and other unique shops which satisfy the eating, shopping, and entertainment needs of the public.